Tae Bo, a combination of martial arts and boxing with some dance moves mixed in, is one of the most popular exercise methods ever devised. Developed by martial artist Billy Blanks in 1976, Tae Bo promises to tone the body while giving a good cardiovascular workout. It is designed to burn fat, help with losing weight and teach some self-defense techniques. Tae Bo was titled based on the Korean word "Tae" -- meaning foot or leg -- to represent kicking and lower body movements, and "Bo" -- short for boxing -- to represent the upper body striking and defense. Blanks says Tae Bo not only works on the upper body (arms, chest, shoulders) and lower body (thighs, buns), but the core muscles (abs, spinal erectors, obliques) too. One of the goals of Tae Bo was to increase functional strength, which Blanks described as the type of strength used on a daily basis. One of Tae Bo's biggest selling points is its cardiovascular workout, which Blanks said was a result of the dance moves added to the already high-energy workout. The benefit of a good cardiovascular workout was the first thing Blanks noticed when he inadvertently created Tae Bo in 1976. Blanks, a devoted exerciser, became quickly fatigued when combining dance moves to his martial arts and boxing workout. Due to the high-energy aerobic nature of Tae Bo, the exercise program will burn calories during the routine, which should translate into weight loss if a healthy low-calorie diet is maintained. In a study conducted by the American Council on Exercise, it's estimated that an average person burns 350 to 450 calories per hour in a kickboxing class such as Tae Bo. 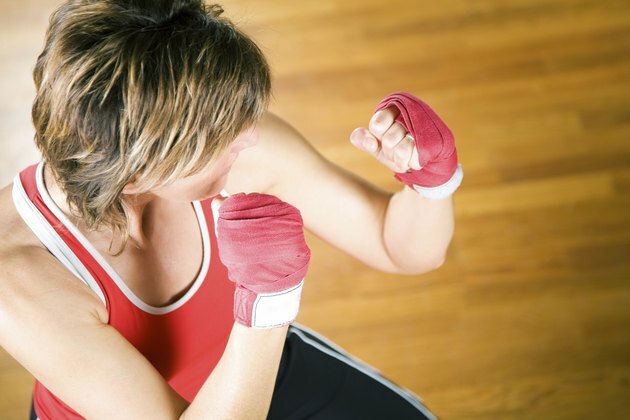 The kicking and punching done during a Tae Bo workout leads to a better grasp of self-defense methods. It's important to note that Tae Bo is not a self-defense course and you should not attempt to use the techniques outside of your workout. Blanks says he hopes Tae Bo users are never put in a spot where they will need self-defense training, but believes that Tae Bo may give them confidence in a dangerous situation. If you are interested in self-defense, seek out a professional who is qualified to teach the appropriate techniques. Vanderbilt University: Tae Bo: Fitness Craze or Effective Workout?